Looking for FREE help with your online marketing strategies? You've come to the right place! Free internet marketing tools from WordStream include tools for keyword research, PPC advertising, Facebook advertising and more. We at WordStream are online marketers too, and every development and feature within the WordStream suite of free Internet marketing tools is aimed at making you more efficient while helping to grow your business. Learn more about our internet marketing tools and features below. The Free Keyword Tool by WordStream is the fastest, most accurate, most comprehensive online SEO keyword suggestion tool available. We aggregate over 1 billion unique keywords, representing over a trillion search queries, and hundreds of millions of related terms from diverse keyword sources. This huge database enables us to supply thousands of long-tail keywords suggestions--far more than even subscription-based Internet marketing tools. It's the best way to find keywords for FREE! The Free Keyword Niche Finder is an innovative new keyword tool that returns structured keyword suggestions rather than a disorganized list. Just enter a keyword to find your most relevant and profitable keyword niches for your Internet marketing efforts. If you already have a keyword list, the Free Keyword Grouper can transform your list (up to 10,000 keywords) into an organized keyword structure ready for high-performance PPC marketing campaigns and an SEO-friendly information architecture. 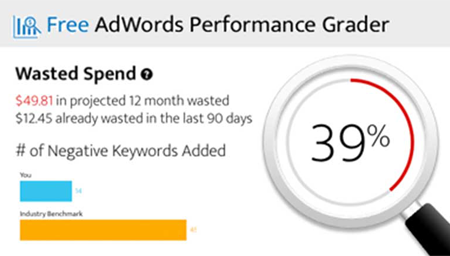 The AdWords Performance Grader has been designed by PPC experts to show you where your campaign is struggling and how to make adjustments that will improve your performance and increase your ROI. This incredibly valuable tool uncovers the AdWords secrets you need for success, and it's absolutely free! Try WordStream's PPC management software. Our software is packed with the most valuable online marketing tools and techniques to optimize your advertising campaigns. Increased Productivity through the automation of best practices. Improved Relevance due to the iterative, learning nature of the software's automation suite. You'll see constant keyword suggestions that you can continually refine and improve upon. You'll also be armed with the tools to effectively act on this data so that you see more and more targeted traffic over time. More Value by allowing you to dedicate fewer resources (in time, money, and talent) to generating more business. WordStream's industry-recognized 20 Minute PPC Work Week guides advertisers through quick and easy actions that can improve campaign performance, grow accounts, and save money. Get your major PPC work done in less than 20 minute a week! WordStream PPC Advisor is available to try completely free for a trial period.